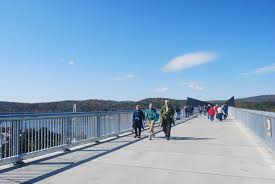 It's not exactly like walking on water but the Trips Committee has arranged an excursion to Poughkeepsie so that you can stroll over the world's longest elevated pedestrian bridge. The Walkway is 212 feet high and 1.28 miles long over the Hudson River. Great views and an exciting experience. The trip will take place on Wednesday, Sept. 27. Sign up in the Trip Book in the hallway opposite the Computer Room. Wed. Sept. 6 NYC "Do Your Own Thing"